Making our land Barnaby Pickle proof…. K: Tonight, after Phill thrust the iPad in front of me, and ordered me to update all our lovely friends and friends-to-be on our week’s progress, I was going to use the opportunity to tell some interesting stories. I WAS going to start with our arrival at Toulouse airport to be met with a dead car, and my first, and successful, telephone encounter with a French breakdown service. It turns out that it works exactly the same as a British breakdown service. And I learned a new word: depanneur. Someone who fixes your “en panne” car. I WAS then going to move on to arriving at our house, relieved at the lack of further flood damage and cobwebs. We were also quite sad/happy to see the little kitten had moved on, but that his/her mother continued to visit. I’m sure I was going to mention our frustration with France Telecom getting our telephone and Internet up and running. Poor Laurette has spend untold hours in the Orange shop waiting for equipment which has ultimately been sent back to Orange HQ. We’ve been promised Monday. Watch this space. I may have even touched upon our very first visitors. Our dear friends Paul and Luke had asked if they could leave their camping tent at our house so they could travel down to France in the future and go camping again. When I say “tent”, read enough seating and equipment to feed/seat 8 people! Anyway, we had a lovely evening and day with them, proudly showing off the shell of our home, experiencing the fabulous Friday Gaillac market, and having a dip in a local lake. But, no. I have decided to tell you none of these things. What I want to focus on (perhaps again) is our good fortune at ending up in a village like this. We met Colette today, a neighbour picking mirabelles (yellow plums), and she welcomed us warmly. I spent an hour with Claude helping me pick and order the perfect firewood. The grandson of the previous owner of our house came by to advise us about the best thing to do with the electrics. His aunt stopped by to say “un petit bonjour”. And I’ve realised how lucky we are while sitting listening to a gorgeous singing bass player in our local cafe, Cafe Joubert, in an atmosphere I can honestly say I’ve only experienced in Greenwich Village in New York. We wandered in, were given a seat by the owner Bernard, and were served the wine he’d promised to recommend the last time we were here (a 100% Shiraz called “Poupre” – Purple. The perfect name for a Shiraz). Very shortly afterwards, a couple came in and asked for a table, but Bernard said it wasn’t possible tonight. I felt awful. I’d just assumed they would be able accommodate us. I went to apologise, and he said not to worry – we’re neighbours, there will always be a table. And 60 seconds to walk back home. Whoever is looking after us, thank you. 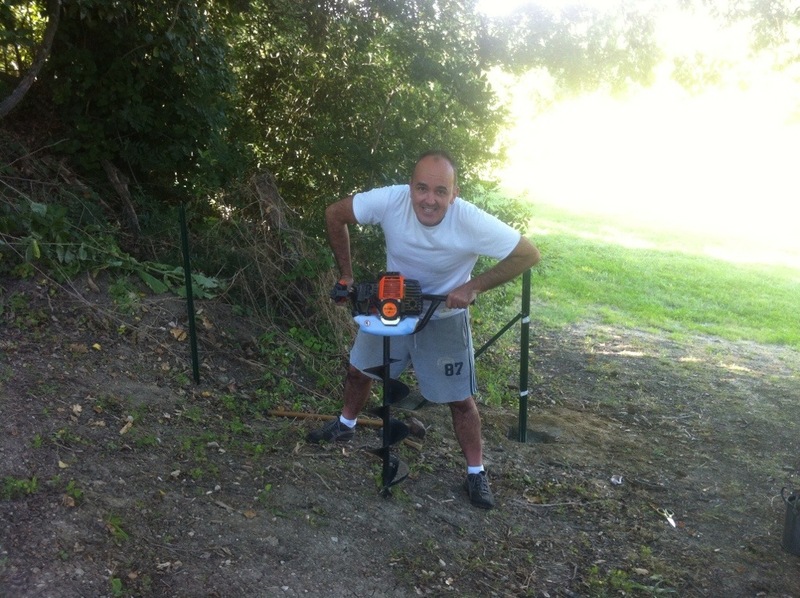 A few pics of Kev toiling the land drilling holes with our new oh dead machine….